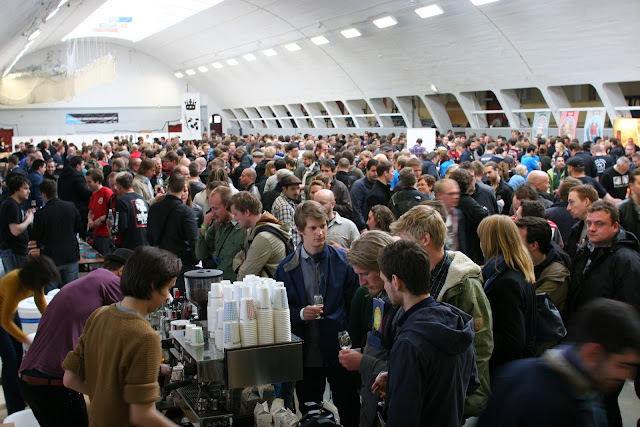 A couple of weeks ago, the 11th and 12th of May, the long anticipated and Copenhagen Beer Celebration took place.A two day festival of only the best breweries in the world, hosted by our friend Mikkeller. So the scene was set for a weekend devoted to great beer. The location was the historic, former tennis court, now the Copenhagen running club Sparta’s indoors running track, at Fælledparken. The guest list was more than high profile, representing some of the world’s best-known quality breweries. To name a few; Three Floyds, Kernel, Brewdog, Evil Twin, and of course Danish Mikkelers, who were arranging the event. All in all, this could not be anything than awesome! 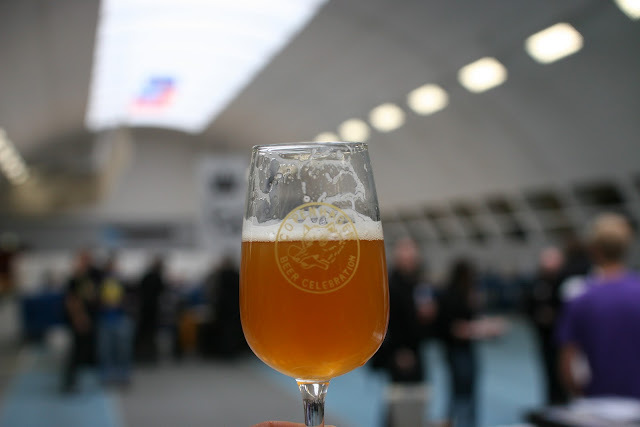 Even though it felt almost as a criminal act to drink beer standing on a running track, especially when there was an athletic competition going on just outside, the simple and authentic setting actually increased the overall focus of this event – to taste world-class beer. Quite a lot of the brewers themselves were present at the event, which gives a hint of the line-up. Aside from tasting beer there was also arranged for a variety of seminars to take place, all in some way related to beer of course. 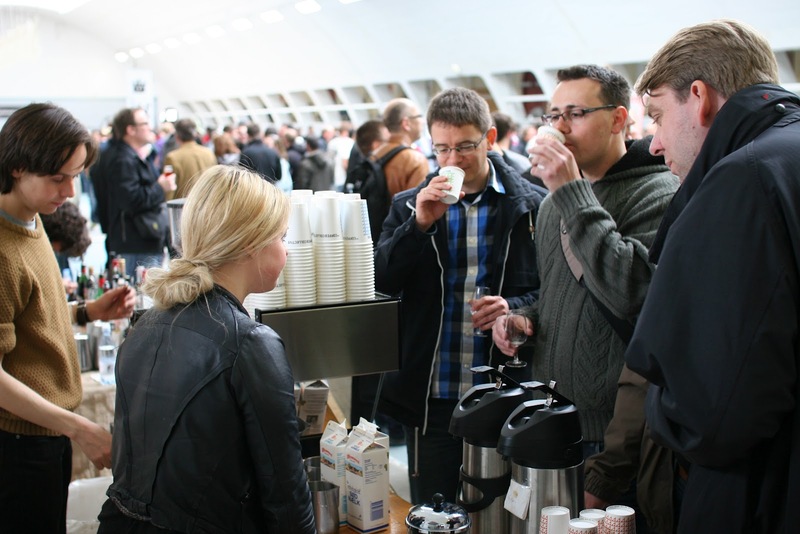 And when people needed a break from tasting beer, paying attention to seminars or networking, that’s when we at The Coffee Collective, came into the picture. For the occasion we were offering special drinks combining both beer and coffee. During the two days we offered the ‘Monks Brazilian Elixir’ and a ‘Hoppyccino’. Both drinks were prepared as cappuccinos. The ‘Hoppyccino’ was made with Simcoe hop infused milk. The singel hop variety had simply steeped with cold milk for half an hour in a frensh press and then it was prepared as cappuccinos.The very fresh and fruity hop, which had some lemonade-notes in it, complemented the sweet milk extraordinary well and resulted in a really interesting and aromatic cappuccino. 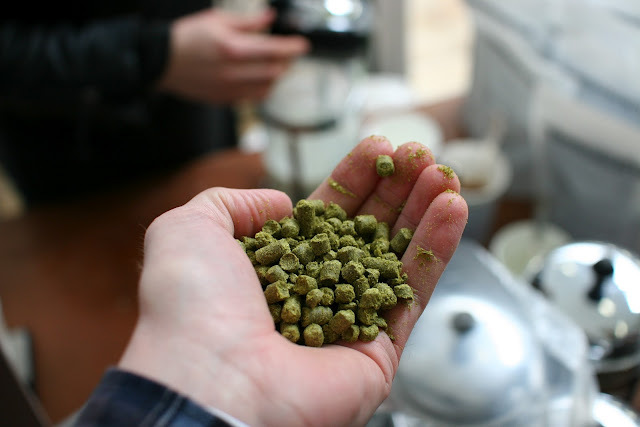 ‘Monks Brazilian Elixir’ was based on our Brazilian bean, Daterra, which had been put into a pickle of the dark Belgian ale ‘Monks Elixir’, and then afterwards the soaked beans had extracted in milk to obtain the sweetness from the ale. The result of this was a cappuccino, which was extremely creamy and sweet. The crowd warmly welcomed both of these experiments, and who knows, maybe ‘Hoppyccino’ will be on the menu in one of our coffee bars one of these days… Rumor has it, that the hop was brought back home to the laboratory for further experiments. All in all, Copenhagen Beer Celebration did turn out as an awesome event for getting the last updates on the global beer-scene, and as an excellent venue for us to be part of. Who would have thought, that the beer-loving people turned out to be just as passionate about coffee.